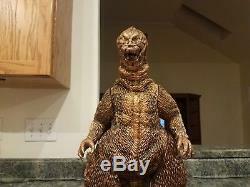 This listing is for the holy grail of Bandai vinyl figures an original Bronze 1964 Godzilla. 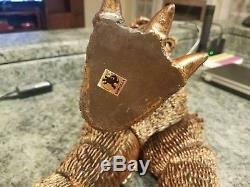 The pictures show the actual item and it is truly original not a repaint in fact the surface is still sticky with a waxy feel to it only seen in the real deal. Released in 1984 with a rumored build limit of 1000 figures it is one of the rarest of Bandai figures. 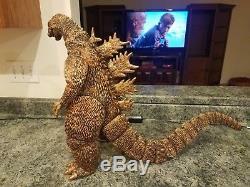 It has been stored in a smoke free environment and all the joints are tight and even comes with the Toho gold sticker on his foot. 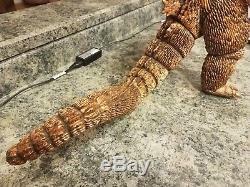 He stands over 22in tall and is about 26in in length. 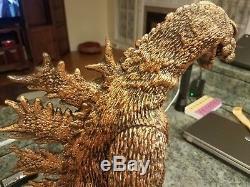 For Godzilla's 30th Anniversary, Bandai produced the Limited Anniversary Bronze Godzilla 64. The figure is done in brown vinyl, unlike the dark green vinyl of the original and reissue. The bronze paint appears to be more brushed on the figure than sprayed. There is a sticky film found on various parts of the body. The foot stamp is the same as the original and the same Toho license sticker can be found on the bottom of the right foot. 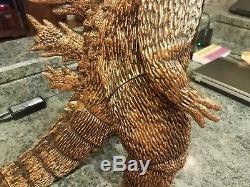 The item "Bandai Godzilla Bronze Vinyl Figure Very Rare in near mint condition FREE SHIP" is in sale since Monday, November 12, 2018. 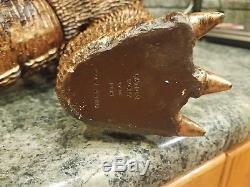 This item is in the category "Toys & Hobbies\Robots, Monsters & Space Toys\Monsters\Godzilla". 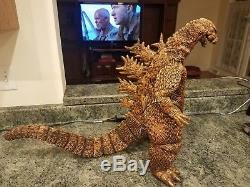 The seller is "godzillanator" and is located in Indiana, Pennsylvania. This item can be shipped worldwide.